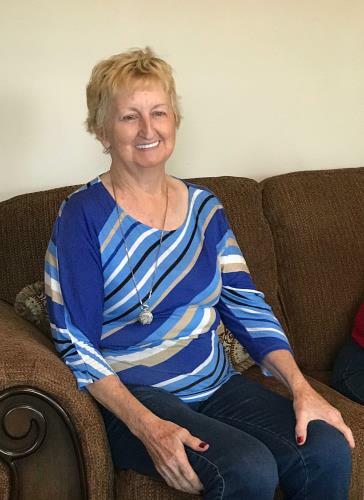 Charlotte Case Marshall, 69, of Jasper, Tennessee, died on Sunday, March 24, 2019, at her home surrounded by her family. A member of Calvary Baptist Church in South Pittsburg, Tn., and worked for 20 years in the cafeteria at South Pittsburg Elementary School. She was preceded in death by her parents, Sylvester & Flora Housley Case, brother, Carl Case, and sister, Brenda Joyce Poe. She is survived by her husband of 42 years, John Marshall, Jr. of Jasper; sons, John Marshall, III and wife, Talisha, of Chattanooga, Tennessee and Brandon Marshall and wife, Tammy, of South Pittsburg, Tennessee; grandchildren, Marlie Marshall, Derek Johnson and wife, Amanda, and Devin Johnson and fiancé, Kaley; great-grandchildren, Zayden Johnson and Ryker Johnson; brothers, William Case and wife, Candy, of Chattanooga, Tennessee and Jerry Don Case and wife, Candy, of Kimball; sister, Mary Ann Hobbs and husband, H.T., of New Hope, Tennessee; sister-in-law, Cecietta Case, of South Pittsburg; dear relative and caregiver, Charlynn Peoples; several nieces and nephews. The family would like to extend their sincere thanks to the staff of Cumberland Health & Rehab and Hospice of East Tennessee for their wonderful care and service. Funeral services will be conducted at the Jasper Chapel of Rogers Funeral Home at 1 p.m. Central time on Wednesday, March 27, with Reverend Ronnie Case officiating. Interment will follow at Cumberland View Cemetery in Kimball, Tn. The family will receive friends for visitation at the funeral home on Tuesday, March 26, from 4–8 p.m. Central time. The family requests that memorial donations be made in Charlotte’s memory to the Alzheimer’s Association, Southeast TN Chapter, 7625 Hamilton Park Drive, Suite 8, Chattanooga, TN 37421 (www.alz.org).